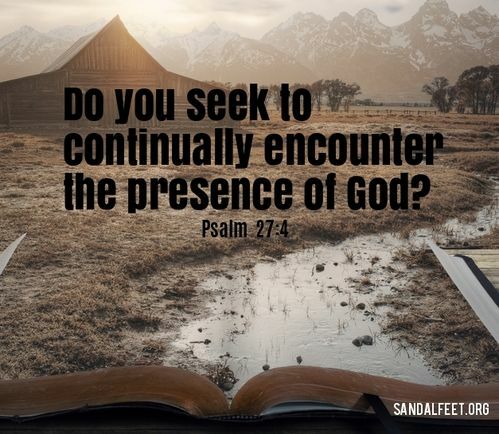 Choosing to continually encounter the presence of God is a lifestyle, not a one-time encounter. Far too many people believe they have to make time. have the time or wait for the right time to have an encounter. This is deception from the enemy. Recognize it, rebuke it, and flee from it…fast! Encountering the presence of God requires desire. Do you desire to sit in the presence of God or are you hiding from Him right now? Do you feel like “this just isn’t the right time” to encounter Him? See what happens here? At times, we need to take action in order to encounter God’s presence. “High above the tree line” represents clearing out all the junk that blocks our view of God. And let me tell you, there’s a lot of junk in the world these days blocking our view of so many things. We need to stop encountering the presence of the media and interaction with social media and instead actively pursue encountering the presence of God. We need to weed out relationships or scale back relationships that are blocking our desire or our access to God-encounters. I love the second line of the song that says God is waiting there for us as we seek to encounter Him. A play perhaps on the verse that says, “Seek me, and you will find Me” (Jeremiah 29:13). God’s waiting for us—you and I—to encounter Him. The next line may cause some to draw back…”With fire in Your eyes.” That fire the song is talking about is the flames of fire spoken about in Revelation 1:14, “His head and his hair were white like wool, as white as snow. And his eyes were like flames of fire.” In John’s account, Jesus’ eyes displayed the fire of searching, penetrating judgment. I can see why some may hesitate to encounter the Lord. No one likes to willingly step into the principal’s office for correction. However, the flames of fire shouldn’t scare us; they should comfort us because God appreciates a heart that is searching for Him. The flames of fire may mean judgment, but judgment is for those who don’t seek Him. The flames, therefore, represent His power. Let me explain. Several years ago, I found myself in a radical encounter with the Lord. When my children were younger, often the only time I could get a moment to myself to think was when I was in the shower. I could lock the doors and hide out if you will. The shower became a prayer closet for me. In July of 2013, I came face to face with His eyes. In a very prophetic moment, God spoke something over my life that I will never forget. In the steam of the shower, it was if His hand was drawing out His words and as He did, His words filled my Spirit. It was so profound that I actually stepped out of the shower to grab my phone to take pictures. After taking pictures of the shower door, I noticed a smiley face on the door…as if God was pleased I was recording this critical message. As soon as I snapped the picture of the smiley face, what appeared in the photo shocked me. You can’t fully see the smiley face in the photo (oh, how I wish you could), but I did, and what else did I see? Two eyes with flames of fire/lightning bolts coming out of them. Jesus, in His power and majesty, had shown up. It was a fall-down-on-your-face and worship kind of moment. I don't always have these kind of radical encounters, but I do encounter the living God whenever I seek Him earnestly and with my whole heart. If I have a distracted heart or a half-in-it kind of heart, why would I expect the God of the universe to show up in His fullness every time if I can’t even give my entire being to Him? He may show up with a little conviction and a “come back later when you are READY” kind of encounter, but it’s not the kind of encounter that I want to participate in. I want to be available and ready when the God of the universe shows up in my prayers, my thoughts, in my hard times, and in my good times. People wonder why they struggle with temptation? I think it is because they are not seeking to encounter the presence of God enough in their life. Every single one of us encounter temptation. No one is immune. However, the devil can’t make you do anything. You are the one who chooses to allow temptation to win. God provides a way out and the way out is always Him (1 Corinthians 10:13). If you are lacking strength right now or flailing in your purpose or passion when was the last time you pursued an encounter with God? When was the last time you climbed up high above the tree line because you want to see Him? In the clearing…when everything else is pushed aside, you can hear from Him, and see Him. He’ll give you exactly what you need in His presence.